Casewell Phillips has resigned himself to life as a bachelor. . .until he meets Perla. She’s everything he’s sought in a woman, but he can’t get past the sense that she’s hiding something. As the drought worsens, Perla’s unique gift divides the town in two, bringing both gratitude and condemnation, and placing the pair in the middle of a storm of anger and forgiveness, fear and faith. I loved this book! Perla was so sure she could stay away from attention in her new life, but when things got tough in the town, her abilities to cook and have more food than they needed caused attention, as well as people who were afraid to eat what she cooked. But many would have starved had it not been for Perla. Read this wonderful story about a women who is talked about, and thought her life was ruined because of one mistake she made. This book was provided by CFBA for me to read and review. This review is mine, my opinion and no one elses! As with her other books, Janice Thompson gives us another wonderful and humorous read that will leave you feeling delightful. Cassia is desperately trying to get away from her fathers hold on her, but it is really more difficult that she would think. As Cassia battles to strike out on her own, I found myself on a most hilarious journey with this adventurous Greek family. 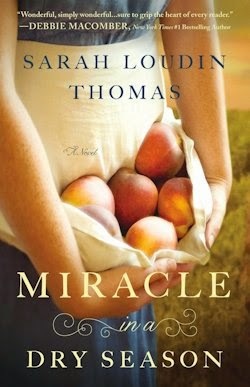 Ms. Thompson makes everything fun, from the seriousness of a situation to the sweet romance, I laughed at scene after scene as this family deals with their situations. The question is, when Cassia finds her purpose in life, and finds love, who will be the lucky hot guy? This is a fantastic light read that I highly recommend! Its fun, funny and very entertaining! I read it in one day, but some may want to spread the fun out over several days. Whatever works for you, I hope you will give A Bouquet of Love a try! I received this book from Revell Publishers to read and review. I was not required to write a positive review. Hi, I’m Amber, but my friends call me Tiff, short for Tiffany, my first name. I am in my mid-30’s, married to the love of my life since July 2007, have a daughter and a son, and live in Colorado. Here, I am content to do what I love—write, speak, and offer virtual assistance. 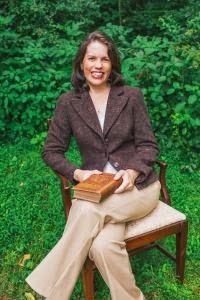 Thanks to the gentle nudging of a fellow author — Tracie Peterson — in 2002, I joined the American Christian Fiction Writers and wouldn’t be published today without them. For those of you who are also fiction writers looking for a wonderful support group, check them out! My very first book, Promises, Promises, sold in December 2006 and released in February 2008. I’ve been going steady ever since. 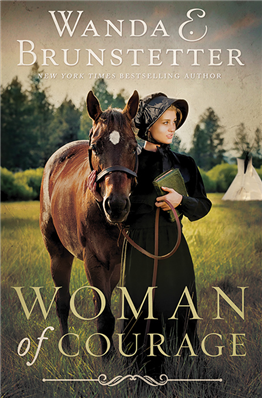 I really loved and enjoyed this third book in the Wings of the Nightingale Series by Sarah Sudin. I was excited to read Kay’s story, and I think this is Sarah Sudin’s best book so far! I really like Kay’s bold and determined personality, but yet at the same time, there was a different side of her that I liked even more. 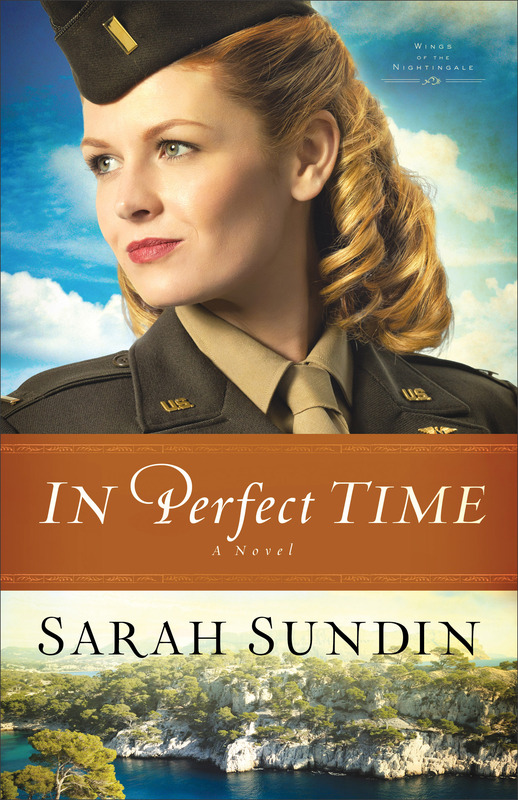 She had a difficult time dealing with relationships, and self esteem, and I love the way Ms. Sudin deals with this, the sweet romance, the details, the vivid scenes, and the amazing WWII history all weaves together and makes an amazingly wonderful read. 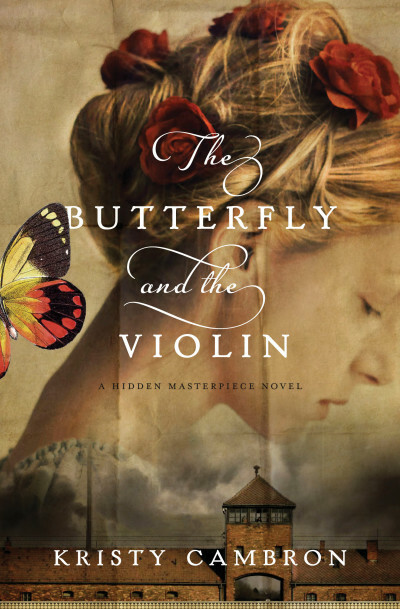 I love reading stories set in the WWI and WWII era, and Sarah Sudin is the lady for writing these historical books! I highly recommend that you pick up a copy of In Perfect Time. But I will say the story is more enjoyable and makes more sense when you read the three books in this series in order! Sarah Sundin is the author of With Every Letter, On Distant Shores, and the Wings of Glory series. In 2011, A Memory Between Us was a finalist in the Inspirational Reader’s Choice Awards, and Sarah received the Writer of the Year Award at the Mount Hermon Christian Writers Conference. Sarah lives in California with her husband and three children. Visit http://www.sarahsundin.com for more information. “I would have had no idea where to start if I had not read this book.”–Denise J. 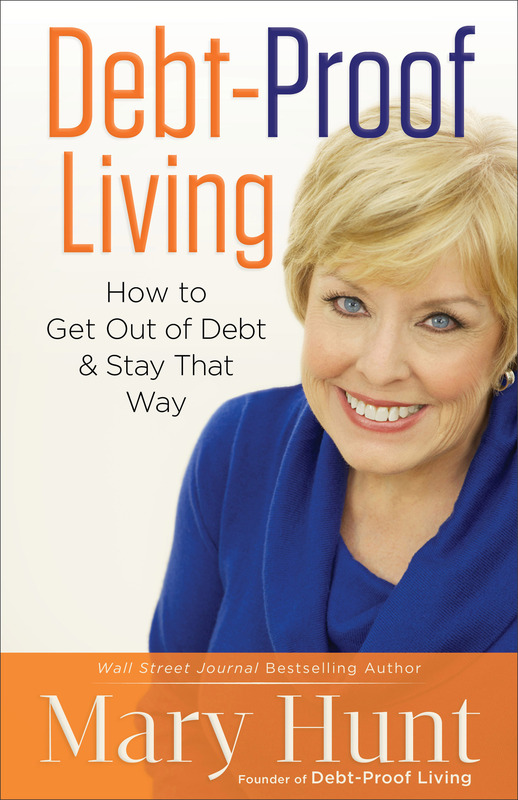 “Debt-Proof Living was our salvation, and now it is our daily living reference.”–Kathy W.
“Because of Debt-Proof Living I have completely changed my thinking about money.”–M. J. “You have changed my life.”–Beth G.
Mortgages, credit card balances, student loans, car loans, and home improvement loans have become a way of life. All that debt is putting not only our present at risk as we live paycheck to paycheck but our futures in jeopardy, as shockingly few of us have enough put away for retirement. But personal financial expert Mary Hunt wants you to know a radical but simple truth–you really can get out of debt and stay out of debt–for the rest of your life. If you have been struggling to pay the bills, if you feel like you just can’t make your finances work, if you feel like your money situation is getting out of control, you need this book. It can change your life, just as it’s changed the lives of hundreds of thousands of others already. As I read Debt Proof Living, I was reminded of many ways that I can help with my finances. Some things in her books is not really new, some are pretty practical, but then Ms. Hunt weaves them all together into one book. She hits on all of the many different kind of debts people may have, and gives loads of neat and helpful tips to help in these suggestions. In following her valuable lessons her in this book, you can be debt free, and if you continue to follow, can stay debt free. But what this book is not, is a quick fix to your finances. It takes work, determination and decisions in order to make it work for you! I really recommend Mary Hunt’s book to you. 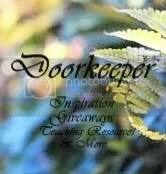 I think you will find help in the valuable lessons, tips and tricks she has here. I received this book from Revell Publisers to read and review. I was not required to write a positive review. The opinions I have expressed are my own. I am disclosing this in accordance with the Federal Trade Commission’s 16 CFR, Part 55. 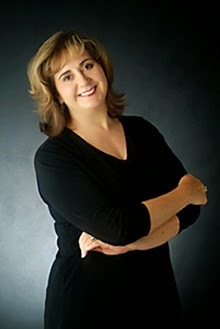 Mary Hunt is an award-winning and bestselling author and the founder and publisher of Debt-Proof Living. Her books have sold more than a million copies, and her daily newspaper column, Everyday Cheapskate, is nationally syndicated and enjoyed by hundreds of thousands of readers. Hunt speaks widely on personal finance and has appeared on shows such as NBC’s TODAY and Dr. Phil. She and her husband live in Colorado. Learn more at http://www.debtproofliving.com. “It has been four years since I really took to heart all the information in Debt-Proof Living. I am happy to report today that we have paid back over $35,000 of ‘stupid debt’ and are currently saving like crazy for a house. I would have had no idea where to start if I had not read this book. Peace of mind is a great gift!”–Denise J. “I want to thank you for writing your book, Debt-Proof Living. It was our salvation and now it is our daily living reference. We had a lot of stupid debt (over $40,000) about three years ago. We have now paid off each and every credit-card account. What a weight was lifted from our shoulders. We used this book every step of the way. We are truly reformed credit-card users. I wish a lot of people would read this book–it’s wonderful. We are now using it to learn about investing our money and saving for retirement. 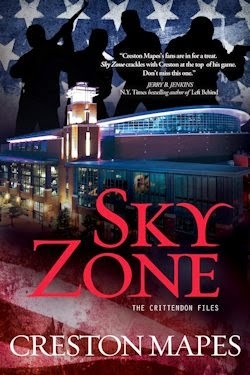 We are living proof that it works.”–Kathy W.
“I bought your book to read on a plane. I did not know then how it would change my life in so many ways. Thank you.”–Joan B. “I picked up Debt-Proof Living from the library. (I know, what a cheapskate!) I wanted to say thanks to you because I can now sleep again at night knowing that there is a way out of our debt-ridden life. I am excited to make changes and not have our life controlled by our money–but rather to be able to control our life and our money.”–Janis N.
“Because of Debt-Proof Living I have completely changed my thinking about money.”–M.J. “I picked up Debt-Proof Living and started to read. Oh my, I kept thinking, this sounds just like me–I am not the only intelligent person who absolutely stinks at money management! I am pleased to say that I have paid off $12,000 with $6,300 to go. Thanks again for being strong enough to share your story. You have changed my life and from what I can see on your website, countless other’s lives as well.”–Beth G.
Guidance counselor Heather Browning is desperate. She needs a mentor to help Simon, a disabled student who is struggling at Gordon Falls High School. Unfortunately, hotshot Max Jones is her only option. Confrontational and cavalier, Max uses his flashy persona to hide the bitterness he’s felt since his life-changing accident. Perpetually cautious, Heather finds Max’s bad-boy bravado as intriguing as it is infuriating. But as Heather and Max work together to build Simon’s self-confidence, they begin to trust each other. Max has never been slow and careful with anything. Can he be gentle with Heather’s heart? 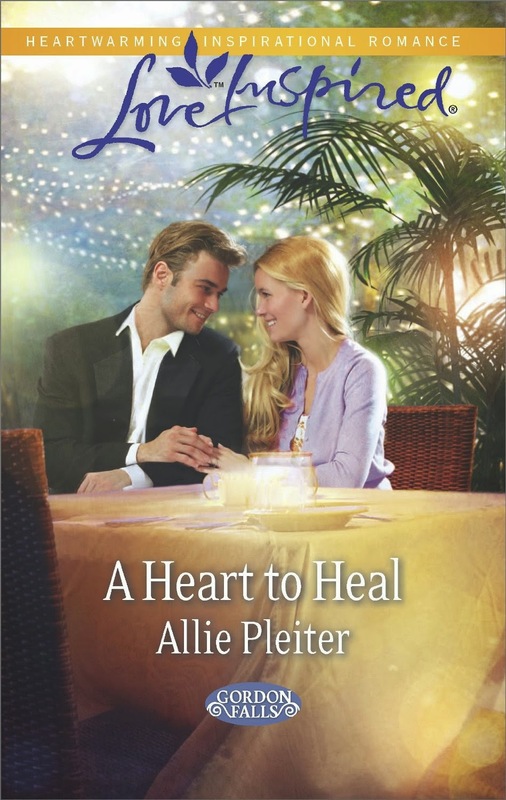 If you’d like to read the first chapter of A Heart to Heal, go HERE. The Blessings of Friendship, created by New York Times bestselling author and artist Mary Engelbreit, is a playful and poignant treasury of poetry, Bible verses, and quotes that celebrate the joy of friendship. Children will learn from timeless sayings and poems what it means to be a friend – helping, encouraging, listening, sharing with, and loving one another. Colorful and whimsical illustrations bring these words to life, as children learn the value of friendship. Verses from the Bible give us instruction on putting others above ourselves, loving each other, and being kind to one another. This book will make you smile with each turn of the page, remembering old friends and new friends alike. When you open a book by Mary Engelbreit, you have opened a masterpiece! And The Blessings of Friendship is such a beautiful book inside and out. 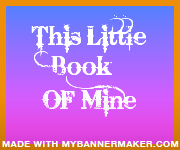 The poems, verses and Scripture are so beautifully written, they are truly a blessing and enjoyment to read! This book teaches the valuable lesson of Friendship. One of the short verses in this book is:” A friend is the first one to come in when the whole world has gone out.” And this is so true of everyone, and something each parent should teach their children. And if you have this beautiful Engelbreit book you will be able to read this to your child as well and let them view the pictures. As well as so many other precious verses and poems throughout this book. And the illustrations are the true classy and amazingly beautiful Mary Engelbreit style! And yes I love using the word beautiful when describing this book because, well it is the best way I know to say it! 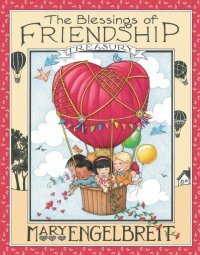 I highly recommend The Blessings of Friendship by Mary Engelbreit to everyone! I received this book from Book Look Bloggers to read and review. I was not required to write a positive review. The opinions I have expressed are my own. I am disclosing this in accordance with the Federal Trade Commission’s 16 CFR, Part 55. This was such a wonderful read! I loved it! Though at times I had a difficult time reading what was happening to Adele and the rest of the prisoners. I felt so bad for Adele because of the circumstances that landed her as prisoner, and then the horrible things she and the ladies with her had to do. And in modern day, Sera was so determined to find the special painting, so would do almost anything, even if it meant flying cross country and meeting a wealthy stranger. The process of finding the painting and the story behind the painting was an amazing story to read. This is a book that will keep your nose in the pages until it is finished. And along with the story of the painting, the two heartwarming romances will warm your heart and stay with you for a long time. This is truly a unique romance story. I love the Christiansen family and I really enjoyed a visit with them again in Grace’s story. Grace never wanted to leave home, she was perfectly content at home with her cooking ability. Was she ever surprised when here siblings give her a three week culinary vacation to Hawaii. But though at first she thinks she will be alone, she suddenly finds out that her brothers high profile pro hokey player Max will be in Hawaii to watch out for her, which is the last thing Grace wanted. Susan May Warren has such a way with words, and uses them well when writing awesome books! I love, love this series and this book! I love how she makes the characters seem so very real! I feel as though I know this family personally! And I love the way she introduces Grace and Max to each other. 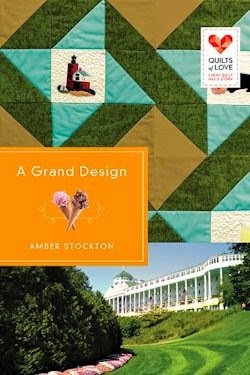 The vivid scenes of Hawaii and the cooking classes, contest, and just everything about the story was just so amazing, I’m still on a high from reading it! I love how Max and Grace are two different personalities, but have so much in common, and Max with his expert side job, or hobby was shocking to me. He just didn’t seem like the type. And I don’t want to keep going on because I will end up telling an important part of the plot, and I don’t want to do that! 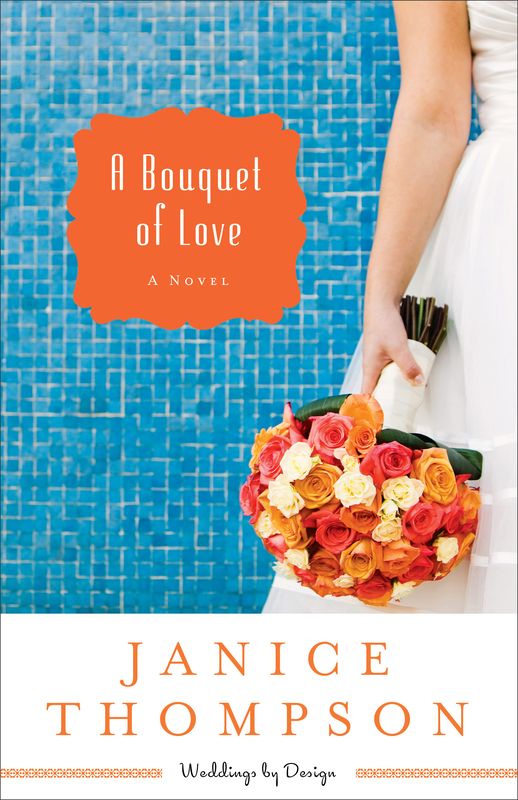 If you love romances, this is a must for you! 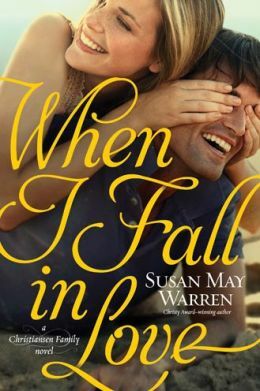 And you want clean, faith base and fun to read added to romance, then you will love When I Fall In Love by Susan May Warren. I received this book from Tyndale House Publishers to read and review. I was not required to write a positive review. The opinions I have expressed are my own. I am disclosing this in accordance with the Federal Trade Commission’s 16 CFR, Part 55.